Golden Globe Race leader Jean-Luc Van Den Heede’s on Matmut has weathered two more southern ocean storms during the past week and is on course to round Cape Horn sometime on Friday. 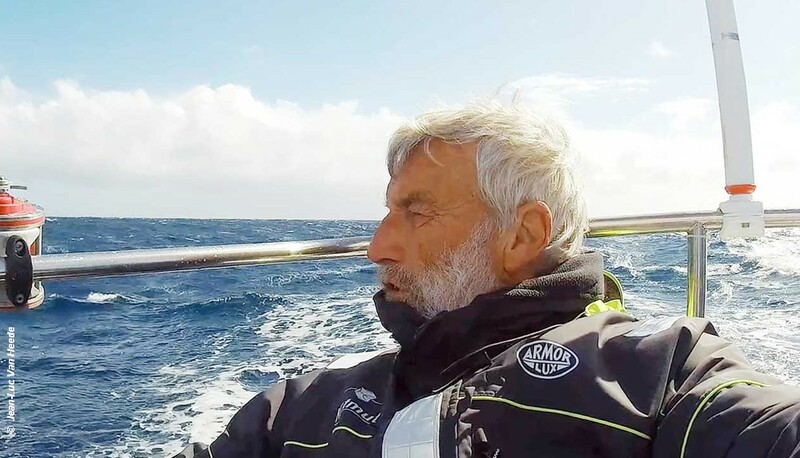 The 73-year old Frenchman is now within 400 miles of Cape Horn, and has a 3-day weather window to slip around before the next series of storms approach. He may just make it in time. Jean-Luc has climbed up the mast five times to check repairs made two weeks ago to the lower shroud tang connections and is satisfied that sailing downwind at least, the mast is safe. Remarkably, Matmut has been averaging between 5.5 and 6.5 knots in recent days with just a headsail set. Second placed Mark Slats who reported light winds and an uncomfortable sea early Wednesday, has now reached the eastern limit of the southern ocean NO-GO Zone and has begun a southerly decent down the latitudes towards Cape Horn. At 09:00 UTC Wednesday, his yacht Ohpen Maverick trailed Matmut by 1,386 miles, and though her speed was 6.3 knots against 5.5 for the leader, the Dutchman has gained only 87 miles over the past 7 days. Slats has to average 1 knot more than Matmut over the remaining distance back to Les Sables d’Olonne if he hopes to win. Third placed Estonian Uku Randmaa aboard One and All, is one of the losers during the past week having dropped more than 200 miles behind Matmut. Britain’s Susie Goodall in the 4th of these Rustler 36 yachts, DHL Starlight, gained a further 60 miles on him. Randmaa had used the calmer conditions to dive overboard to clean the barnacles from the bottom of his yacht and had cleared 85% of the growth when he spotted a shark circling the boat. He made a hasty retreat back onboard – and has not been back in the water since! American/Hungarian Istvan Kopar sailing the Tradewind 35 Puffin in 5th place, has been penalised with a 6 hour 40-minute time penalty for entering the Southern Ocean NO-GO Zone Tuesday. The time penalty being added to the 24-hour penalty picked up when Kopar stopped in the Cape Verde Islands to repair his self-steering and used his satellite phone.